A native boy’s death in Edmonton goes way beyond just another piece of news. 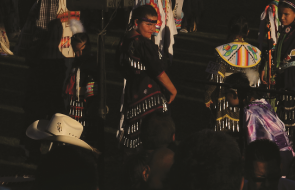 It poses questions about life in a place of poverty and social injustice…in Indian Country. At about 10 P.M. on November 2, a 14-year-old boy told his adoptive father he was going out to visit his grandmother. The boy and father had recently returned to Edmonton from British Columbia and were staying with friends. He walked out the door to find snow covering much of the ground, despite the unseasonably warm temperatures—about 6 degrees Celsius. A cool, misty rain fell from an overcast sky. It must have felt like spring. At over six feet tall, lithe and thin, the boy walked in the body of a man. He should have been able to cover the short walk to his grandmother’s house, about two blocks away, in a matter of minutes. But the boy would not arrive at her door that night. In fact, he would never see her or his father again. What happened next is a mystery. Either the boy ran into some acquaintances along the way or he lied to his father, as teenage boys are wont to do, and headed off to a local hangout, perhaps a nearby billiard parlour where the boy and the two young men accused of beating him to death were known to gather. They may have drunk a little high-test malt liquor. The police have said alcohol was a factor in the crime. However it played out, the boy found himself pinned against the brick wall of Highland Junior High School well after midnight. Highland is an old school, built in the first year of the Great War and expanded as the Cold War heated up some 40 years later. The sandstone walls of the main building give it a hefty, Edwardian look. Bell tower over the front door; portables in back. Surrounding the school on three sides are small bungalows that have seen families move in and out of this working-class neighbourhood for more than five decades. It was behind this school that the boy made his last sound, a scream that carried through the night like a wildcat’s. So piercing was his cry, it woke people living in a nearby house; they peered out their windows into the darkness across the street. There, they saw what must have looked like a group of people, teenagers, dancing feverishly in a dark corner. They called the police. It was 2:20 a.m.
A few minutes later a police cruiser pulled up to find four youths moving across the schoolyard. Three walked; one ran. One was covered in blood. The boy’s face had dissolved in darkness. An ambulance took him to the Royal Alexandra Hospital, where the emergency team treated him for critical trauma to the head and severe internal injuries, and admitted him to the intensive care unit. It wasn’t until hospital staff cut away the boy’s pants that they discovered a name on his thigh, scribbled in the dark ink of a ballpoint pen: Garrett Campiou. A young native boy who had come of age in a community rife with poverty and neglect and social injustice more often associated with the Third World. In Indian Country. While the Young Offenders Act kept the identity of the accused out of the newspapers and off the television news, Garrett and his very extended family were trotted out regularly on the media stage. A multiplicity of families gave Garrett a range of surnames: Dumont, his biological mother’s maiden name; Lefthand, his biological father’s family name; Campiou, the last name of his first adoptive parents; and Chalifoux, the name of his second adoptive family. His biological mother and father had disappeared from his life long before that November night in the Highland schoolyard, but foster and step-parents pointed fingers at each other in the newspapers, and members of a family tree broad as a weeping willow spoke of a peaceful and quiet kid who wanted everyone to like him. 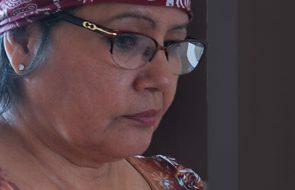 From behind a cloud of cigarette smoke at the drop-in centre of Edmonton’s Canadian Native Friendship Centre, its executive director, Melanie Omeniho, a friend of Garrett’s family, describes Garrett’s situation. “[Garrett’s biological mother] had a large number of kids to care for and Garrett’s father had just died. Garrett was the youngest. She wanted what was best for him so she gave him to someone else in the [extended] family to look after. “She wasn’t a prostitute,” says Omeniho. The report was simply untrue. Indeed, the media seemed out to blame the attack on someone they could immediately identify, even if the nearest scapegoat happened to be his entire family or, in a bizarre twist, Garrett himself. The same anonymous foster mother told reporters that Garrett suffered from fetal alcohol syndrome (FAS), a cluster of birth defects caused by prenatal exposure to alcohol that renders its sufferers, among other things, impulsive, susceptible to explosive outbursts of anger, and unable to understand the long- term or more abstract consequences of their behaviour. No medical doctor or child welfare agent publicly corroborated this “truth” about Garrett that was so unequivocally denied by members of his family. In any event, it had little bearing on the case—except that if Garrett did suffer from FAS, it may have contributed to provocation of the attack. The media, however, homed in on it like black bears to a garbage dump. The FAS angle, even if it were true, would shed no light on the situation, except to call into question the moral character of the victim, Garrett, and his native mother. It was behind this school that the boy made his last sound, a scream that carried through the night like a wildcat’s. So piercing was his cry, it woke people living in a nearby house; they peered out their windows into the darkness across the street. There was no mention, for instance, of the need to address the vicious cycle of poverty, addiction and despair that has, over the last 200 years, settled onto native culture. Nor was there acknowledgement of the colonial juggernaut of European settlement, captained by an indifferent political and economic system and imbued with anti-aboriginal racism. Two months later, his adoptive mother was killed in a car accident. This left his adoptive father, William Campiou, to look after five children, including Garrett. The arrangement didn’t last long. Although he has enjoyed periods of sobriety throughout his life, William was fighting a losing battle with the bottle. He simply couldn’t look after the children. Garrett became a ward of the province and eventually ended up at a province-run ranch for boys. At some point Garrett was sent to live with his first adoptive mother’s sister’s family, the Chalifouxs. But according to Melanie Omeniho, the Chalifouxs couldn’t provide a stable environment for Garrett either. Once again he became the responsibility of Children’s Services and spent time between foster homes. And then back to the Chalifouxs. In the meantime, William Campiou sobered up and moved to British Columbia to live with one of his adult daughters. Garrett went out to visit him and didn’t return. Three months before the attack, William and Garrett moved back to Edmonton. They shuffled from place to place, staying with friends. Garrett enrolled in a high school for inner-city youth, but had trouble attending classes regularly. And then he was beaten to the very edge of his life with a garbage can. As I read through the newspaper reports, I couldn’t help but wonder: Why the unearthing of all the details about Garrett Campiou? What bearing did Garrett’s life have on his tragic death? After all, he was the victim, not the accused. Three hundred kilometres to the south, in Calgary, I asked 22-year-old Redmond Littlechief to consider his own life in the light of Garrett’s story. Littlechief is the son of a former tribal chief of the Siksika Nation, a member of the Blackfoot Confederacy, an hour east of Calgary. Although he has since turned his life around and begun to help his people, he is all too familiar with the Indian Country Garrett and his alleged attackers have travelled through. Unemployment on the Siksika Nation, he says, hovers around 70 per cent; the high school dropout rate is about 75 per cent. His friends and relatives commit suicide at 20 times the national average. Hopelessness hovers close, like a plague. When Littlechief was 8 his family moved to Bowness, a working-class neighbourhood in northwest Calgary. By the time he was 15, Littlechief had become an experienced young offender—fighting, break and enter, theft. The thrill of simply stealing cars soon wore off, so one night he stole another car and took it on an erratic joyride through a middle-class neighbourhood, side swiping several parked cars and causing thousands of dollars in damage. He was charged with more than a dozen offences, including 10 counts of theft over a thousand dollars. Why the violence? Littlechief ’s anger earned him 18 months in jail. Four days before Christmas I went to the provincial courthouse in downtown Edmonton for the bail hearing of one of the youths accused of the second- degree murder of Garrett Campiou. When I walked off the elevator I found three native men, one with a long braid down his back, sitting solemnly on a bench in the hallway outside the courtroom. Inside, court had already come to order. At least half of the 20 or so spectators were natives. Ah, I thought, this must be the place. Case after case rolled by, all but one involving native offenders between the ages of 12 and 23, most of them frequent visitors to the stale courtrooms of Alberta’s justice system. The oldest of these was a Chalifoux, one of Garrett’s stepbrothers who had a rap sheet as long as a river. This time he was charged with breaking and entering the night before Garrett was beaten beyond recognition. He was denied bail. As the bail hearings came to a close, I still hadn’t heard the case for which I had come. A mix-up on the docket had put me in the wrong room, but what I had witnessed firsthand was the distressing frequency with which Alberta’s young native people are turning to crime. There is a certain mythology that permeates conversations about youth crime in Alberta, that youth crime, especially violent crime, is on the rise. But the statistics refute any such claim: although youth crime has doubled over the last decade, it has levelled off and even declined in recent years. Youth murder rates have, in fact, remained unchanged for 30 years. What is shocking is the number of native people, especially those under the age of 18, languishing in Alberta’s criminal justice system. According to the 1998-99 figures from Statistics Canada, native youth in Alberta make up just 7 per cent of Alberta’s total youth population. But of all young offenders sentenced to custody (jail), almost 40 per cent are of native ancestry. According to Alberta Children’s Services’ website, native children “make up a small portion of Alberta’s children, but as of December 31, 1999, aboriginal children made up 36.6 per cent of all child protection cases.” If Garrett’s story is any indication, the correlation between the percentage of native children in protective care and the percentage of incarcerated youth who are native should come as no surprise. Dr. John Brooks, clinical director of forensic psychiatric services at the Alberta Hospital, concurs. After leading me through heavily locked doors flanked by two security guards and a metal detector, he cites several factors, including poverty, neglect, alcoholism and lack of education, that make native youth more susceptible to the anti-social behaviour often at the dark heart of violent crime. Most native leaders agree that the answer to that question must come from within the aboriginal community itself. Back at the Canadian Native Friendship Centre, where the air hangs heavy with sweetgrass, Melanie Omeniho talks about how they hope to help native teenagers avoid the fate of Garrett and his attackers. “Lots of programs are very superficial. We can bring kids here to play volleyball, and we know they’re safe while they’re here, but that doesn’t have any long-term impact. “For us as aboriginal people, we need to go back to our traditional values. We need to strengthen our family units. Our elders used to base their decisions on what would hap- pen seven generations hence. Now we can’t even look after our own kids. Littlechief embarked on that journey while serving the 18-month sentence he earned for his crime spree. He educated himself about the plight of native peoples in Canada, about the Indian Act, and about the legacy of the residential schools, which he says created a sense of hopelessness that reverberates through native young people even today. He was released early to participate in a drug and alcohol rehabilitation program that taught him much-needed job and social skills. His old friends drifted away. Most continued lives of crime and drug abuse. Some committed suicide. But still he pressed on, and the answers he found began to fill the void. Like an evangelist, Littlechief took his epiphany public. In early 1999, he organized the “Wake Up Call: End Youth Violence” conference for urban and on-reserve youth in Calgary and surrounding areas. Later that same year he founded the Urban Society for Aboriginal Youth (USAY), a youth council fighting to make heard the voices of Calgary’s aboriginal youth. 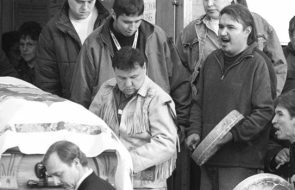 In 2000, Littlechief launched a campaign to publicize the suicide crisis affecting native youth at Siksika and across Canada. Upstairs, his family and friends burned a little ceremonial sweetgrass and prayed to the Creator. The doctors had told them Garrett’s injuries were too severe; the body remained but Garrett was already gone. They stopped blaming each other for his tragic life, and the boys who might soon be held directly responsible for his tragic death, and focused on one thing: what was best for Garrett. Together they decided to take him off life support and allow him to walk with the Creator. And then, together, they watched the doctor pull the plug. Jeff Gailus is a Canmore writer and conservationist.